Sunday, April 28th at FoxTail in Rohnert Park. Check in starts at 11 a.m.
Shot-gun start (means every team of 4 starts at a different hole) at noon. There is a hole-in-one prize - NO HOCKEY DUES FOR PLAYER OF CHOICE FOR A YEAR!! Closest to the pin, longest drive, best team score, best 9-hole (in case some stop early). We also have a marshmallow drive contest and putting obstacle course for those not wanting to play a full round of golf. Every golfer gets a goodie bag, cart with a partner, box lunch, and coffee and donuts upon arrival. A four-some that signs up under a SRJHC player gets the player $50 off dues. Hat Trick - $2500 - sponsor a hole, advertising in future Flyers pamphlets / Tournament, four golfers, and $350 toward a player's dues. Wristy - $1000 - Sponsor a hole and advertising. Congratulations to the PW BB team for winning the state Championships! It is with great pleasure that we introduce to you the Santa Rosa Junior Hockey Club Board of Directors for the 2019-2020 season. The term begins on May 1, 2019, but many of the newly elected members will be shadowing with the outgoing members with the hopes of creating a smooth transition. You must purchase BBQ Tickets in advance. SRJHC Flyer Alumnus Goes in WHL Draft! Click the link above to sign up for travel tryouts! There will be no sign ups at the rink. You MUST sign up on line before you arrive to the first try out time. 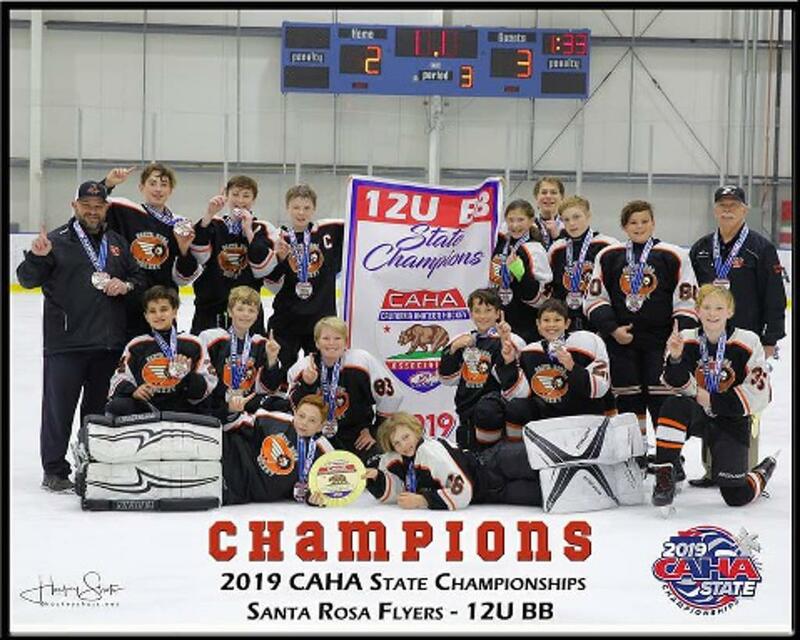 Click the link above to learn more about Santa Rosa's spring hockey program including the Memorial day tournament in Roseville! Friday April 26, 2019. Snoopy's home ice. 5:30-7:15 pm. Please Help SRJHC Support Youth Hockey!